There is nothing like a rainy morning to motivate you to look to see what pics you have not posted, that you clearly intended to.... OK, that is a lie. A rainy morning does not motivate me to do really anything but go back to bed. :) I did, however, pick up the laptop and memory card to see what was there. I found a wealth of fun stuff. We will start with nesting, though it really looks like everyone is having pretty good success along these lines. 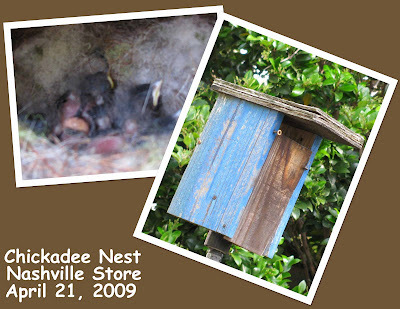 The Chickadees really got busy at the Nashville Wild Birds Unlimited store. I snapped these quick pictures a couple of weeks ago, but have not been back recently to see if they have fledged yet. Based upon this pic, I would say that the chicks were 2-3 days old that day. If that is the case, they should fledge any day now. This box is what is considered to be a Sparrow repellent box -- the theory is that it is not only smaller than the Sparrows desire, but also allows too much light into the interior. Whatever the reason, I have never had problems with Sparrows in this style nesting box. It is called a Kentucky Style Slot Box... this particular box was made by the professor that developed the style, Dr. Wayne Davis. The birds Thank You, as do we, Wayne! 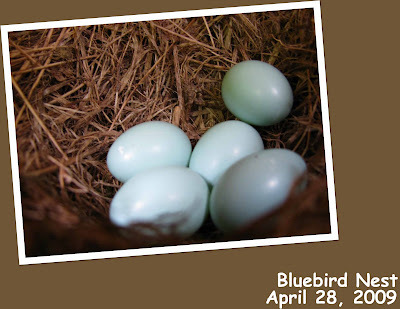 This is the Bluebird Nest at my home. As of yesterday, the eggs had still not hatched. In other NESTING NEWS... It has been confirmed that my Barred Owls have a nestling in the aforementioned Very Dangerous Nesting Box. Just Monday, we saw one of the parents taking a pretty good sized rodent into the box to feed their chick. All this rain concerns me, as I can not believe that that chick is at all dry. Kent reminds me constantly that if they had nested in a natural hole, it is unlikely that the conditions would be much better. For good or for bad, that is where they are. The chick should be fledging in the coming week.